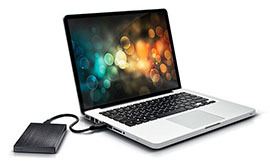 External hard drives for Mac are always great helpers for Mac data backup/restore/transfer. But external hard drives for Mac are a dime a dozen, making it a highly labor intensive process to pick out the best one. Here we selected out a list of best portable hard drive for MacBook Pro/Air/iMac, based on price, transfer speed, reliability, portability, durability and some other important criteria. Before you shell out money to buy a top Mac external drive, you might as well try a free method to turn your iDevices into USB flash drive to store data. Yes, you can make full use of your existing iDevices, and mount them as portable external USB drive for Mac to transfer and backup data. All you need is a third-party tool, MacX MediaTrans, which can easily mount iPhone as hard disk drive for Mac, making it quite convenient and most importantly, secure and free, to store music, movies, videos, photos, documents, dmg exe files, to name a few. The data transfer speed is quite overwhelming - 100 pieces of 4K photos copy only takes eight seconds. And it's quite simple experience for even a tech savvy person to get hang of it. Step 1: Launch the hard drive disc for Mac mounter after you download the tool on Mac, connect your iPhone to computer with USB cable then. Step 2: Click "Flash Drive" button on the main interface to get a start. Step 3: Click "Add" button to add files, documents, videos, photos etc. from computer to iPhone iPad etc. or simply drag the wanted files folder to the interface as it shows below. Since many users recommend LaCie as the best external DVD drive for Mac, we put the 1TB version on the top of the best external hard drive for Mac list. Claimed as being even rain-resistant, and pressure-resistant, it can be easily carried wherever you go. 700MB video file can be transferred with USB 3.0, which is quite satisfying in speed. With secure password protection software built-in, it's also the best portable hard drive for MacBook Air/Pro/iMac to backup Mac, restore Mac data in terms of security. It says the best external drive for Mac with Thunderbolt and USB 3.0 connector can transfer data in a speed of up to 240 MB/s. 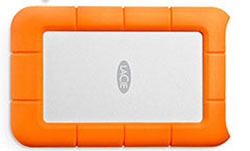 LaCie Rugged Thunderbolt is a good choice for users requiring more data security and mobility thanks to its hardware RAID 0/1 flexibility and two-meter drop resistance. However, some users complain that the best Mac external hard drive is not as fast as they believer. Know More Top Fast File Transfer for Mac. 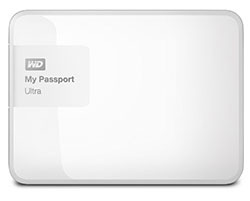 It's the best external hard drive to backup Mac compared with other items from WD. Speed is improved a lot in this model. Optional AES hardware encryption is offered by the best hard disk drive for Mac, you are free to block and unblock the drive and restore data for Mac. Four colors are available, black, blue, white and berry. The best Mac portable hard drive for is suitable for both Mac and PC. Also see iPhone flash drive app. The extra 200GB of free OneDrive cloud storage make the best HDD for Mac more appealing, which requires a register of your drive on its official site though. With Lyve App, data backup on the best portable hard drive for MacBook is being reached within the app anywhere and anytime. It has up to 4TB version priced at $119.99, 4TB fast $199.99, with data transfer speed up to 220MB/S. 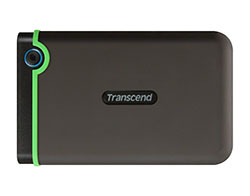 This Transcend 1 TB StoreJet can transfer large file with speed of up to 100MB/s according to users report. the 256-bit AES file and folder encryption sounds good. 2TB version only costs $ 102.99, which is really cheap on the list of best external hard drive for Mac. The so claimed military-grade shock resistance, however, is not expected as it ought to be. It's durability needs to be improved. Data encryption, auto backup and Cloud-enabled backup are all allowed by the top HDD for MacBook. It is available in various capability, 1TB, 2TB, 3TB and 500MB. 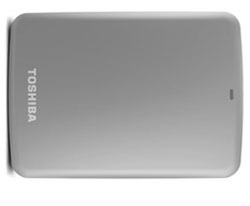 Stable and fast data transfer speed of the updated Toshiba Canvio Connect version is highly praised by users. It's a great choice for best portable hard drive for Mac hunters. If you are looking for the best portable firewire external hard drive for Mac, this one is probably what you want. 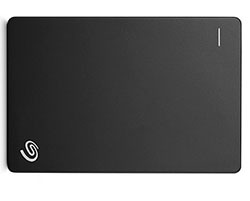 The G-Technology G-DRIVE 500GB top portable firewire hard drive for Mac is good for Mac data backup/recovery and video editing. Time Machine-ready, bus-powered operation and Firewire port are appreciated features. 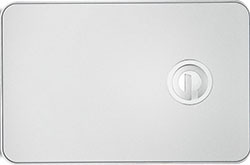 Note that this best-rated hard disk drive requires computer with OS X 10.5 or later and USB 3.0 or FireWire 800 port.